This is Mel's High Level Mastermind that is by APPLICATION ONLY! The Thinktankers have the highest level access to Mel, his guidance and each other's support to design, create, build and grow their businesses and lives. This is an execution-focused, results-driven group. The Thinktank focuses on you, your dreams, your life and how we can create the business to bring all of that to reality. It is a unique combination of coaching, curriculum and community that when combined with your execution will accelerate & elevate your success. We will be about creation, refinement, execution and results. Ultimately, I want you to have a year that is a breakout, breakthrough year! 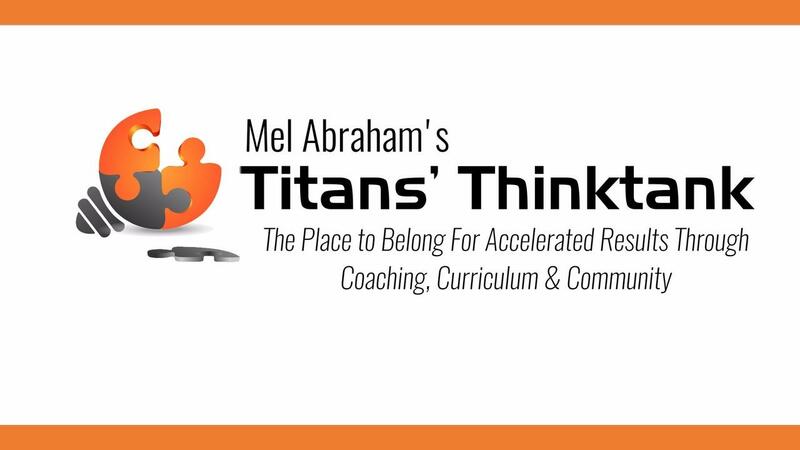 The Thinktank is strategically designed to get you the support, guidance, resources and accountability to navigate any challenges & move you down your success journey through a series of live calls, trainings and strategy sessions. Quarterly Themes: Each quarter we will focus of a different part of your business. This allows us to dig deeper into what drives your success and for you to execute effectively moving forward. (themes include Perspective, Positioning, Platform & Process). 90-day Check-In’s: Each quarter we will review your last 90-day progress and look at what tweaks, changes or adjustments you need to make for the 90-days. This will allow you to get the most out of each 90-day sprint. Hotseat & Q&A Calls: We will have regular monthly group calls where we will deliver new content, do hotseats and do q&a’s. This gives you access to knowledge & guidance you need to keep moving forward. Individual Strategy Calls: You will get 3 one-on-one strategy calls (typically 30-45 minutes) with Mel to solely focus on your biggest need. Each session and notes will be recorded and provided to you after the call. This will give you some specific one-on-one time to fine tune your business. Online Members-Only Portal & Group: All Thinktankers will get access to the group membership portal for our training, recordings and resources. This gives you access to Mel, his team and the group to ask questions, get guidance to work through challenges and celebrate your successes.